Property 20: Dog-friendly Coosawattee River Resort cabin with deck, hammock, & shared pools! Property 22: Peaceful Private Cabin, Hot Tub, Fire Place & Dogs Welcome! Property 23: Riverfront pet friendly very private cabin sleeps 10 with hot tub and fire pit! Property 35: River View From 4 decks/2 Game Rooms/Hot tub/Privacy/Pet Friendly/Kids Paradise! 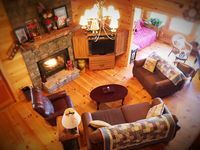 Property 37: Cozy Blue Ridge Mountains cabin w/ private hot tub & wood-burning fireplace! Property 42: Luxury cabin, tranquil, secluded, just minutes from town! WIFI Stone Fire Pit!! Property 46: Large, dog-friendly cabin w/ private hot tub, shared pool, and mountain views! Property 49: Mountain view lodge w/ a private hot tub, game room, & a shared pool, tennis! 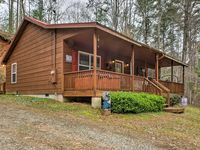 Cozy Cabin With Hot Tub And Internet, Gas BBQ Grill & Fire Place. Property 50: Cozy Cabin With Hot Tub And Internet, Gas BBQ Grill & Fire Place. Absolutely loved the place. Enjoyed the location and the amenities. Laura was great in helping find things to do as well as the directions to the property. She goes above and beyond to be helpful with our stay.